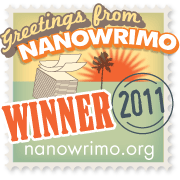 The NaNoWriMo word count post – WINNER! I will be updating this post as NaNo progresses. This way I can keep track of how I’m doing in more than one place. Day 7: 3,548 written (17,056 total) It’s early but my mind is wandering too much to do anymore tonight. I have been a bit bad at updating this! I have written a little bit every day except for two days were I was too busy and distracted. Day 14: 25,065! I have now hit the halfway mark to the 50k goal! Day 27: 47,301. Yikes, I missed updating a lot. The end is in sight and I would have finished tonight but it is already 11:30pm and I need to work in the morning. I will finish tomorrow! Day 28: I have validated my novel and won with a total of 50,138! My novel is far from finished and then I get to edit, edit, edit! As you can see from my graph, I started out strong and then slowed down. There were a few days where I did not write and a few where I wrote only a few hundred so it’s not very visible with the bars. All that matters is that I kept writing and that is what allowed me to win. I worked on getting my ideas down and writing what I had floating around in my head without worrying over every little detail at the time. When I finish, I can go back and edit and add in the thinks I skipped over or was not sure about at the time. Either way I a enjoying writing this story and hope to finish it and maybe even take the next step and take it to a real editor! Haha, I guess we’ll see on that last one. Sometimes I procrastinate a lot so I’ll work on finishing writing the story first and then the next steps when the time comes. 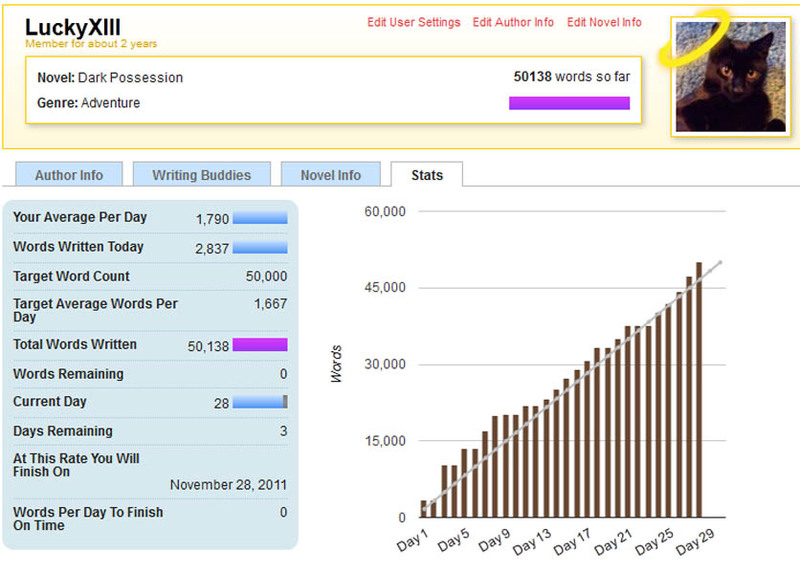 Today is the fourteenth day of NaNoWriMo and I have just hit the halfway mark. There have only been two days where I did not do any writing and a few days that were slow, but I am still going. I am still enjoying writing this particular story and I have confidence that I will be hitting that 50k by the end of the month. I was ahead by a lot with the word count, but those two days I did not write have put me at just a little bit ahead. As long as I don’t fall behind, or if I do by only a small amount, I will keep going. How is everyone else doing that is participating? I know on the second and third day there were already some incredible people that hit the 5ok. I really don’t get how they could write so much in such a short amount of time! I think they have some kind of magical keyboard that helps keep their fingers moving. That or a brain that is overflowing with ideas! Anyway, good luck to everyone else still writing, hang in there! It’s that time of year again! Tuesday is November first and that marks the start of National Novel Writing Month, or NaNoWriMo for short. For those of you who don’t know what it is, the goal is to try and write 50,000 words in the month of November! Yes, that is a very big number but you’ll be surprised at how fast it goes by. If you write 1,667 a day, then you will hit your goal at the end of the month. This will be my third year participating and while I did manage to win my first year (you ‘win’ if you hit the 50k and no, your story does not need to be finished to count! ), last year I was too distracted and ended up forgetting about it. This year I plan to keep with it and WIN. Unlike my first year, this year I already know what I will be writing and have even started writing out my character bios and other information. Yes, this is allowed to be done before the Nov. 1st date! The only thing that will be considered ‘cheating’ is to start the actually story before that date. Here are a few things I’ve learned from my first year and some tips from various other places. 1) The 1,667 a day count is just a suggestion for keeping yourself on track. If you can’t write that much then don’t freak out about it. Some days will be slow while others you’ll find you won’t be able to stop writing! You’ll make it up eventually. *Always try to write something. Even if it’s just a paragraph and nothing more, write it! Keep yourself going and don’t worry if things don’t make sense, that is what editing is for. *Don’t edit your story during the month of November! Just focus on writing and hitting your daily goals and the end word count. Save all the editing for the end or you will end up losing time and falling behind. You will not be writing perfect your first go through, and you wouldn’t be even with out a time limit. *Sign up on NaNoWriMo! There is a wealth of information that can be found there. You can submit your writing and it will keep track of your word count for you and let you know if/when you win once you hit the 50k mark. You can also find your region and find people in your area who are also participating. Many groups hold meet ups call write-ins and they can be very helpful in keeping you motivated. You can also post on the forum if you need help with any part of your story, from naming your character to help with the plot! Check it out! *Don’t forget your basic needs. Many of us end up skipping meals and sleep while writing like crazy to meet that 50k goal. If you skip meals and sleep, then you won’t be able to focus on your writing and that will slow you down or worse, you will run into writers block. *Breathe! NaNoWriMo is here to help us get our creative juices flowing. Don’t panic if the end of the month is coming and you are no where near your goal of finishing. If you force yourself to write then you will start to hate it and that is not what is supposed to happen. Just keep writing and focus on your story. The goal is mostly for fun and there is no reason you have to stop writing once the last day passes. *You don’t have to, but try to plan ahead. Unlike my first year, this year I have started a very basic outline. I have a list of main characters with short bios, as well as a list of some places I want to use in my story. I usually get an idea for something but when I go to write it, the idea has vanished. This time I am writing things down as they come to me so that won’t happen when I go to write it. *It is okay if things are not in order! The important thing is to keep writing. If you need to skip around in your story to keep going, then do it! Details can be added later and things can be sorted once the story is finished and you are getting ready for the editing phase. *Most importantly HAVE FUN! If this starts to feel like work or a chore, then take a step away from your desk, drop what you are doing, and relax. Try to remember why you wanted to participate in NaNoWriMo in the first place. It’s because you like to write, correct? If you are enjoying yourself then you will find you are able to write more then when you feel forced. On the NaNo website I have found a free online writing site that is already super helpful. It is called Yarny. Since it is online, you can access it anywhere there is an internet connection available. It is also very very basic and easy to use! I’m already loving how you can organize by snippets into people, places, or things. No more going between multiple documents, it’s all right in front of you and able to be seen all at once. It also keeps track of your word count! Check it out if you have been looking for a writing program to use. I did mention that it was free, right? Well, these are just some things that have come to mind for me and thought I would share them. If there are any other WriMo’s out there I’d love to hear from you! Last night I managed to get a little over 2,000 words written but I’m still behind. I’ll need to work extra hard if I don’t start writing more. I’ll be busy this weekend at least one of the days, so I’ll need to try and make sure I don’t get distracted by something. Last night I would have written more except I got distracted with trying to find a song I had stuck in my head and then stopped writing after that. As soon as I get home from work and have something to eat, I’ll get to writing again. Urgh, day three and the only thing I have written so far is the title of my story. I realized that I’m going to have to do a lot more research than I first thought which is why I haven’t started. I’m thinking I’ll have to switch story ideas (I have a few) so I can get going. At least I should have Thursday next week off from work so if I do I can hopefully catch up on writing. For NaNoWriMo! I’ve already got an idea in my head and I’m going to work hard at winning this year like I did last year. I just hope I finish what I start this time as my first novel is still unfinished. For those who don’t know, National Novel Writing Month (NaNoWriMo for short) is where you challenge yourself to write 50,000 by the end of November. It sounds crazy, but it’s possible. Check out the official site if you want to know more about it.